Pure launches new Evoke D6 Bluetooth digital radio | What Hi-Fi? 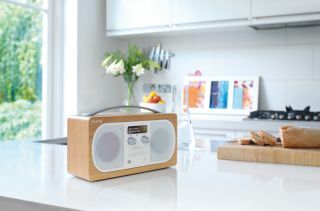 Pure has long been a specialist when it comes to the trusty radio, with enough four- and five-star reviews to back that up. Now, the company reveals the latest generation of its Bluetooth-enabled digital radios with the Evoke D6. The new "streamlined" Evoke D6 has two front-facing speakers and, of course, Bluetooth connectivity for wireless streaming to go with its FM/DAB/DAB+ tuner and its real oak veneer finish. Pure claims that the custom drive units have been designed and built in a way that delivers "optimum dynamics with a smooth natural frequency response" . The Evoke D6's power is supplied by an integrated 20W digital amplifier. Along with the radio and streaming funcitions there are an auxiliary input, two alarms and touch-sensitive SnoozeHandle. An optional rechargeable F1 ChargePak (around £30) will deliver a claimed 65 hours or so of portable listening, while 30 presets (15 DAB and 15 FM) with five access buttons should allow you listen to your favourite stations with little fuss. “The Evoke range has been critically acclaimed for its sound and design," says Pure senior director of sales and marketing Nick Hucker. "And, as such, the new Evoke D6 is engineered for those who truly love great quality music." The Evoke D6 is available exclusively from John Lewis at launch for £180.